A sleep disorder – technically known as a somnipathy or dyssomnia – is any medical disorder which negatively affects a person’s healthy sleep patterns. Usually this involves less than adequate sleep to the extent that this may interfere with the person’s normal physical, mental and emotional functioning, but excessive sleep (such as in hypersomnia and narcolepsy) can also be a problem. At least seventy, or by some counts over a hundred, different disorders that can affect sleep have been identified, the most common and well-known being insomnia, sleep apnea and restless legs syndrome. Typically, sufferers may complain of difficulty getting to sleep, difficulty staying asleep, intermittent wakefulness during the night, early morning awakening, or combinations of any or all of these. It should be noted that the vast majority of those afflicted with sleep disorders (even some of the more garish and extreme ones) are not suffering from unaddressed psychological problems as was once assumed, but have healthy psychological profiles similar to the rest of the population. Sometimes, being the room- or bed-partner of someone with a sleep disorder can be a kind of sleep disorder in itself. Snoring, sleep apnea, restless legs syndrome and periodic limb movement disorder are often the worst offenders here, but it can be highly disruptive of sleep to live with someone who regularly suffers parasomnias like night terrors, confusional arousals, sleep-walking, etc. Even having to be on constant alert to care for an infant, or a sick or elderly person, has earned its own disorder label: caretaker insomnia. 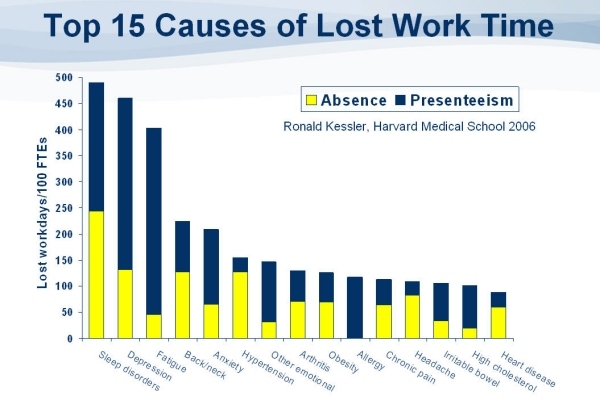 Sleep problems are a notoriously common issue, and may be the single most common cause of lost work time (see diagram below). In one recent study, nearly 60% of Americans complained of insomnia symptoms a few nights of the week or more, and up to 20% may be affected by chronic sleep disorders. Another study, more commonly quoted, indicates that 30%-40% of adults suffer from some degree of sleep loss in any given year, with about 10%-15% categorized as chronic or severe. Yet another study, this one in Canada, suggests that around 15%-25% experience transient insomnia (any difficulty falling or staying asleep, including those attributable to sources such as stress, jet lag or merely too much coffee), with a further 10% or so experiencing chronic or severe insomnia. It should also be noted, though, that sleep state misperception (see the separate page on Sleep State Misperception) is quite common, and often people actually sleep significantly longer than they think. 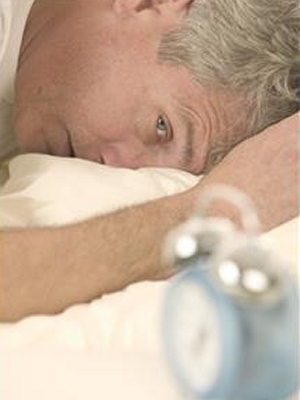 On the other hand, many sleep disorders are notoriously difficult to diagnose and are often mis-diagnosed. 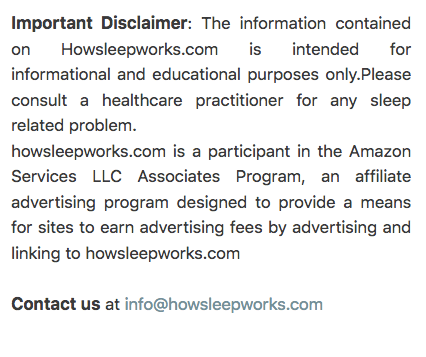 Sleep disorders, and the general low priority given to sleep in today’s world – “you snooze you lose”, “sleep is for losers”, etc – impose a multi-billion dollar economic burden on society. In the USA alone, sleep disorders cause an estimated $16 billion in direct costs to the economy each year, and an additional $100 billion in indirect costs such as litigation, property destruction, hospitalization and death. Another study, by Harvard Medical School in 2012, has estimated that chronic sleep deprivation from all causes costs the USA around $65 billion each year in under-productivity. The negative aspects of insomnia and other sleep disorders, though, need to be kept in perspective. Most of the more dire effects are related to long-term, chronic sleep disorders, and do not result from occasional or mild sleep problems. It is all too easy to unthinkingly make a bad night the scapegoat for a bad subsequent day, and daytime fatigue and sleep are not as perfectly related as they might sometimes appear. Furthermore, avoiding or cancelling daytime activities after a bad night’s sleep may merely reinforce a person’s belief that they are unable to deal with sleep loss, further increasing anxiety about sleep and exacerbating the problem. Deliberate daytime inactivity will only serve to further reduce sleep drive, while exercise has known health and sleep benefits and so will often be a better choice after a bad night’s sleep. Low daytime energy levels may be sleep-related, but may also be due to a whole host of other unrelated factors, including poor nutrition, anemia, dehydration, lack of exercise or fresh air, boredom, mood disorders, immune-related problems, hormone-related problems, etc. Sometimes, a greater acceptance or openness to sleep problems or daytime tiredness (rather than combativeness or resistance) may lead to more calmness and less anxiety, a good first step towards coping with or solving ther problem. 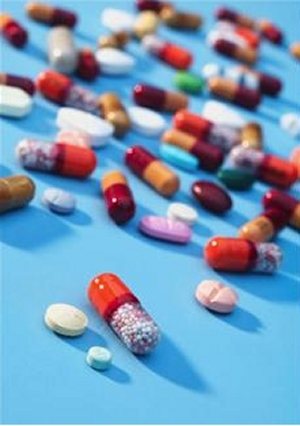 Although sleep disorders have also engendered a multi-billion dollar sleep medications industry, some very simple, low-cost and non-pharmacological solutions – not the least of which would be some general education on the value of sleep, and some simple sleep hygiene recommendations – would go a long way to reducing this societal burden and reducing our unhealthy reliance on medications. Cognitive behavioural therapy (CBT), the workhorse of most modern approaches to dealing with sleep disorders, generally consists of two main parts: firstly, convincing a patient that their problems are manageable, and secondly establishing a good system of sleep hygiene. There are a plethora of medical and counselling websites and self-help books which deal with sleep disorders in great detail, so this section just describes briefly some of the more common ones. Sleep medicine, the diagnosis and therapy of sleep disturbances and sleep disorders, is now a recognized medical subspecialty in many countries, and it is recommended that those who feel they may be suffering from sleep disorders consult a professional for treatment.